It took me a few days, but I finally finished this one. I have a number of other projects in progress as well that I feel a compulsion for finishing. Tomorrow promises another Waxahachie adventure in plein air painting, and I’m ready. It is often said “The public does not appreciate art!” Perhaps the public is dull, but there is just a possibility that we are also dull, and that if there were more motive, wit, human philosophy, or other evidence of interesting personality in our work the call might be stronger. I posted the Robert Henri quote with tongue-in-cheek, because pedestrians had to climb a hill to see what I was doing, and many of them did, the interest always seemed genuine, and the cordiality was heart-warming. I even had the pleasure of conversing for a little while with a reporter for the Waxahachie Daily Light, their local newspaper. In my past six years of participation in Paint Historic Waxahachie, I have always found the public in this town very interested in art made on site, and the conversations were always engaging. I can’t wait to return to this town tomorrow in search of another subject to paint. I am here because “art” brought me here. Obedient, I came. Artists toil in cells all over Manhattan. We have a monk’s devotion to our work–and, like monks, some of us will be visited by visions and others will toil out our days knowing glory only at a distance, kneeling in the chapel but never receiving the visitation of a Tony, an Oscar, a National Book Award. And yet the still, small voice may speak as loud in us as in any. Back in the 1970’s and 1980’s I toiled late into the night in the minister’s study, writing sermons, preparing Bible lectures and writing papers for seminary classes. From the 1990’s until now I have exchanged that discipline for the production of lectures and lesson plans for university and high school classes. Since about 2006, I have also spent thousands of solitary hours in the painter’s studio. The one constant throughout all those decades of creative solitude has been the conviction that revelation was about to happen, that a visitation would occur, that darkness would yield to the light. And I still live that way. This has been an amazingly quiet Friday night, after a noisy day in public school. 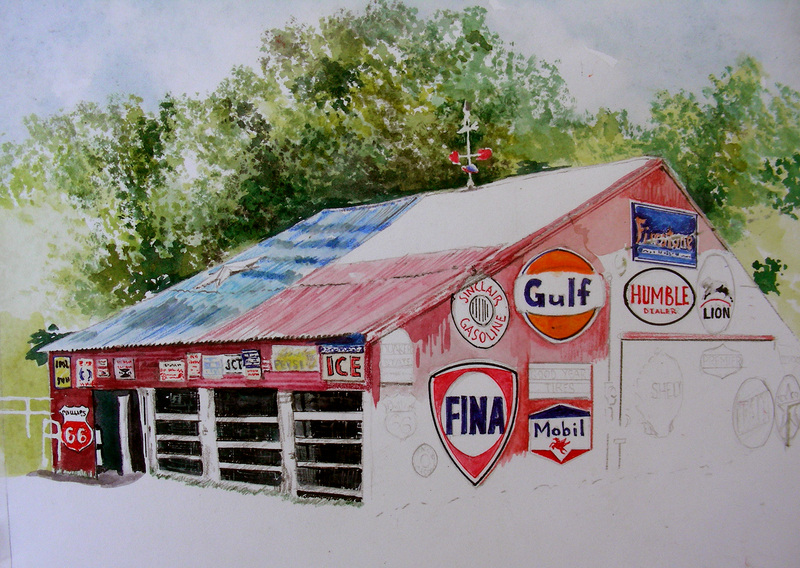 The weekend offers organized plein air activity, and I plan to participate in that as well. Time spent with other painters is always time well-spent. But I would not have exchanged the sweetness of this evening for anything. Julia Cameron wrote it well–artists toil in cells like monks, expecting the glory of some kind of visitation. 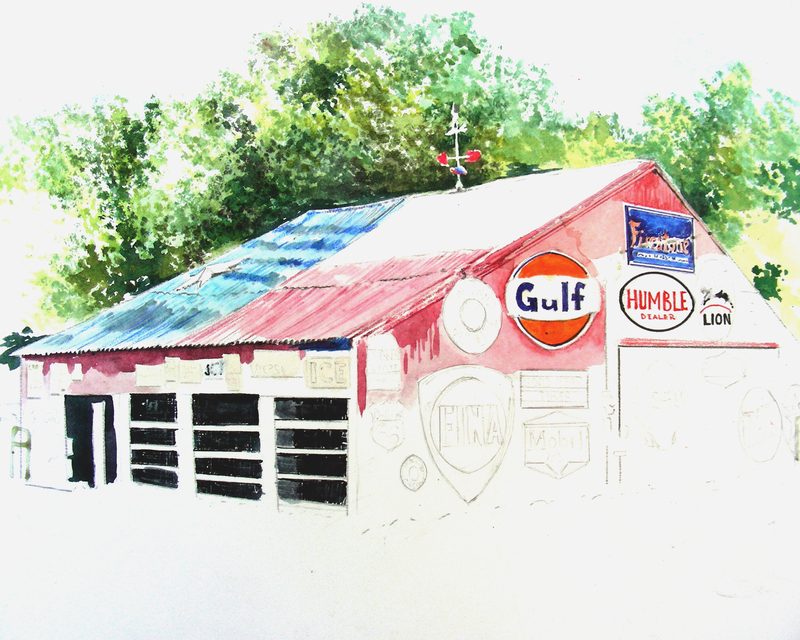 I am nearing completion on this barn I encountered in Ovilla, Texas a couple of weekends ago, and am also finding joy in a large painting of an historic Louisiana house. The quiet of the evening has found ways to nurture me and affirm that what I am doing is quality work. That alone is sufficient reward, filling me with a sense of eudaimonia. Forgive me. I am not a trained literary critic, so my comments on texts may not fit mainstream published interpretations. However, I am a bona fide lover of literature, a lover of the printed and spoken word. I delight in lingering over language, believing that revelation is always possible. As I’ve been painting this sign-covered barn, these words from William Butler Yeats have been washing over me in successive waves. No doubt some of the reason is due to the recent passing of beautiful Maya Angelou. Incidentally, I did read her poem “On the Pulse of Morning” at the opening of yesterday’s Philosophy class. And yes, I choked on the final stanza, as I always do. Her words flood me with uncontrollable emotion. Funny–in years long past, I have wrestled and fretted over this William Butler Yeats text, was required to teach it in senior English, and always felt unable to “get it.” But now it speaks to me soothingly as I come to peace with my own aging, and feel a serenity when I linger in the presence of unaging monuments erected in days gone by. 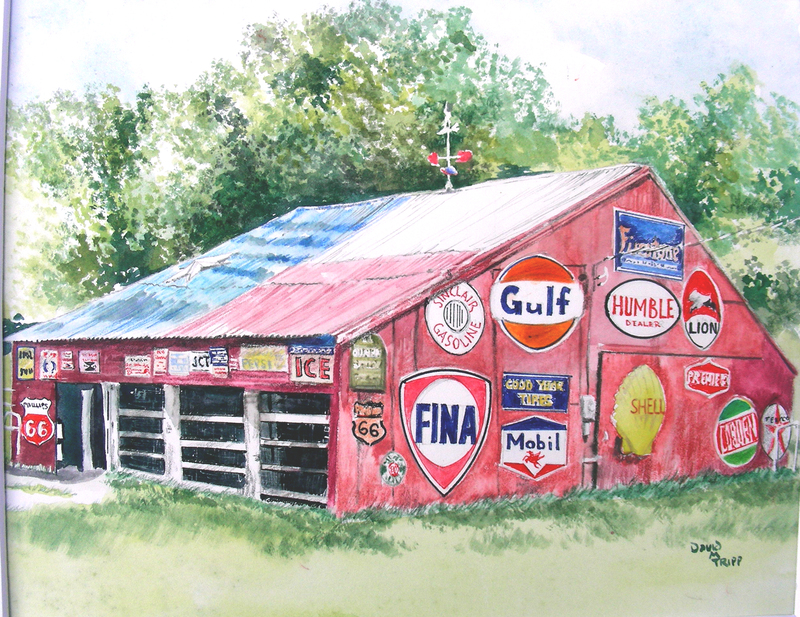 This well-preserved barn from Ovilla, Texas, clothed in advertisements by companies–many of which no longer survive–whispers a presence to me during silent moments as I gaze upon it. The barn still stands in quiet majesty, though many of the companies advertised exist only in the memories of aging intellects. Thus, I experience that dual feeling of presence and loss as I look upon this subject. I have had difficulty finding quality time to work on this painting since the end-of-year procedures at school are taxing my daily hours, leaving little time in late afternoon to paint. But when I do enter the studio, I feel that I have sailed into the holy city of Byzantium. 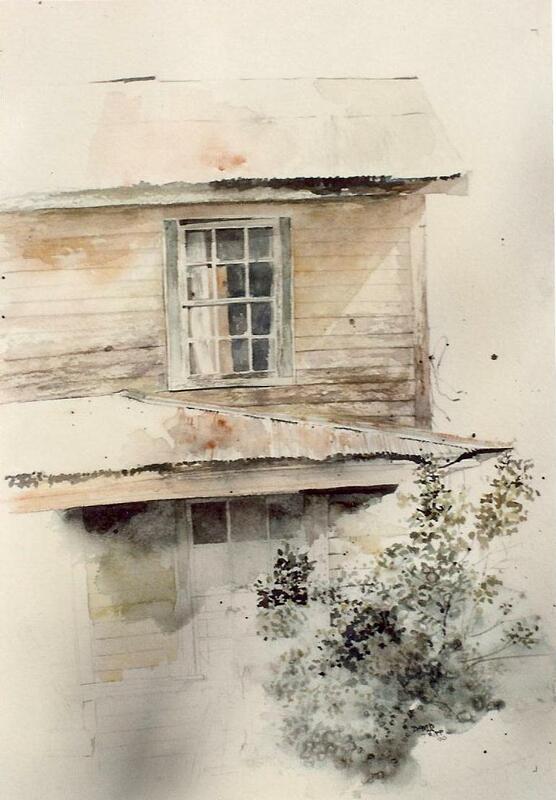 The fading northern light of these spring afternoons provides a warmth and comfort to me, and bending over these watercolor compositions leads me into a sublime realm. 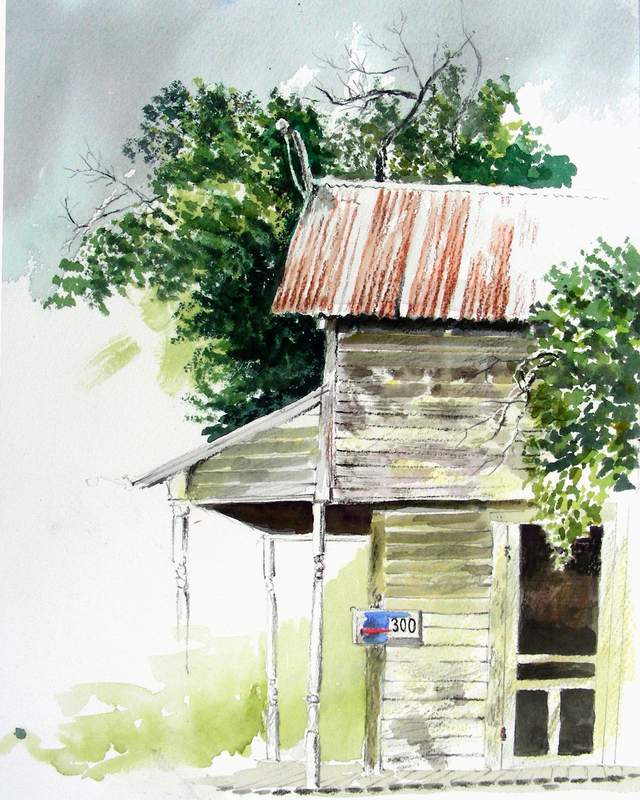 The Waxahachie plein air experience begins tomorrow and will run non-stop for a week. I am anticipating a rich experience of painting in the open air once again. On the morning of the Inauguration of President William Jefferson Clinton, I was working at Lamar High School where I taught. Walking through the receptionist’s office, I heard the television broadcasting the Inauguration and froze in my tracks, listening to the recitation of the poem “On the Pulse of the Morning.” I did not know Maya Angelou, but as soon as the copy of that poem hit the Barnes & Noble Store, I purchased it and tried on several occasions to inaugurate my high school Philosophy classes by reading it aloud before the students. I seldom could finish it without choking up. I read I Know Why the Caged Bird Sings and my life changed. I cannot express my feelings for the beautiful, creative soul of Maya Angelou. When I transferred to Arlington Martin High School, I was offered a commission to paint a mural outside the Little Theater upstairs (pictures of it in its entirety may be seen on my website www.recollections54.com under “Murals”.) I found a photograph of a young Maya Angelou playing solitaire at a table. 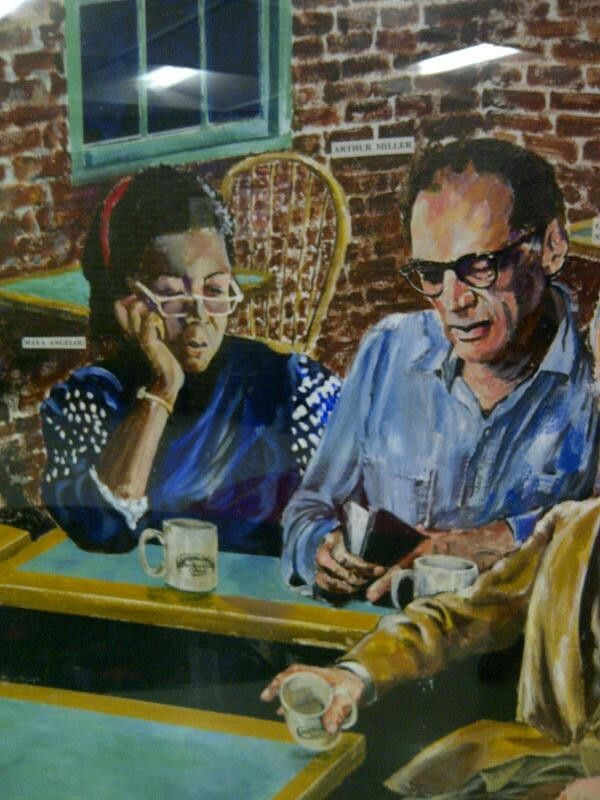 I removed the cards, and placed her alongside Arthur Miller in this cafe setting. I learned this morning that Maya Angelou has passed away. I feel this grief profoundly. Something sweet has passed from the atmosphere. I’ll never find the words to describe how her pathos moved me. I am yours — your passages have been paid. The deeper current carries no propaganda. The shock of the surface upheaval does not deflect it from its course. It is in search of fundamental principle; that basic principle of all, which in degree as it is apprehended points the way to beauty and order, and to the law of nature. I am still working on the dualism posted earlier today, involving the deep-seated permanent truths vs. the superficial changing phenomena always demanding too much of us in day-to-day life. After spending most of the afternoon and evening hours on the two watercolors posted above, I began to lose the northern light I depend on in my studio. Texas temperatures are cooler now, compliments of recent thunderstorms. Feeling a touch of cabin fever, I snatched up my journal and Robert Henri book and headed for this beautiful green belt at the Arlington Highlands. I didn’t know till I visited that location last evening that there was a Starbuck’s Cafe located there. Treating myself to coffee, I took up temporary residence on a large flat boulder overlooking the coursing stream below me, and read for a long time, occasionally scribbling out my ideas in the journal. The gentle laughter and babbling of the flowing water over the rocks below soothed my soul and provided a much-needed decompression time. This past weekend was a real bugger-bear in more ways than one. I’m glad finally to recover my physical and emotional sense of rest and repose. At this age, I am still trying to sort out my identity as a practicing artist, knowing I have this deep-seated desire to paint meaningful memories, yet still making decisions on technique and compositions. Of course, I will never reach the bottom of it, but still I can become fretful when I feel I am not making enough progress. This morning’s meditation on the Presocratics is still with me–each of those thinkers sought the ultimate Ground of life, and I suppose that is what I am trying to do as I pursue the arts. Let us settle ourselves, and work and wedge our feet downward through the mud and slush of opinion, and prejudice, and tradition, and delusion, and appearance, that alluvion which covers the globe . . . till we come to a hard bottom and rocks in place, which we can call reality, and say, This is, and no mistake; and then begin, having a point d’appui below freshet and frost and fire, a place where you might found a wall or a state . . . There is a solid bottom everywhere. We read that the traveller asked the boy if the swamp before him had a hard bottom. The boy replied that it had. But presently the traveller’s horse sank in up to the girths, and he observed to the boy, “I thought you said that this bog had a hard bottom.” “So it has,” answered the latter, “but you have not got half way to it yet.” So it is with the bogs and quicksands of society; but he is an old boy that knows it. I suppose I am not yet half way to this hard bottom. So, I’ll continue to search the depths. Time is but the stream I go a-fishing in. I drink at it; but while I drink I see the sandy bottom and detect how shallow it is. Its thin current slides away, but eternity remains. The 2013-2014 academic year slides now into its twilight, and we spent the morning in my high school Philosophy class attempting to pull the drawstring on the bag containing the fragments of wisdom collected throughout the semester. Norman Maclean and Henry David Thoreau have provided a framework for my current musings on a philosophical summation. Sifting through the philosophical fragments of the Presocratics, we find two thinkers who fastened their outlook on opposite worldviews. Heraclitus of Ephesus, arguing that one cannot set foot in the same river twice, concluded that the essential core of life is flux, or change. Everything flows; nothing abides. Parmenides of Elea, on the other hand, maintained that the core of life was stable, eternal, permanent; there is always Being. A century later, Plato synthesized these thinkers, positing a world of appearances, physical, always changing, yet supported by a world of ideas, pure Being, eternal. Throughout western history, thinkers wrestled with these two poles, seeking the seam that unites (or divides) them. As a passionate fly fisherman, I think on these things nearly every time I enter a Colorado mountain stream. As my eyes survey the waters, I eventually detect the seam dividing the swifter current from the deepening pools, and if I look long enough, I can see the rows of trout lining the seam, staying in the quiet waters while watching their food drift by on the flow. I take delight in watching my dry fly drift down the current, close enough to the seam to entice a rainbow to rise. There is an undercurrent, the real life, beneath all appearances everywhere. In these times there is a powerful demarcation between the surface and the deep currents of human development. Events and upheavals, which seem more profound than they really are, are happening on the surface. But there is another and deeper change in progress. It is of long, steady persistent growth, very little affected and not at all disturbed by surface conditions. There is so much truth to mine from these literary musings of great minds from the past. Another day opens, I am back in school, but my mind and tender sentiments keep returning to yesterday and time spent in front of the shuttered Ferris, Texas lumberyard. 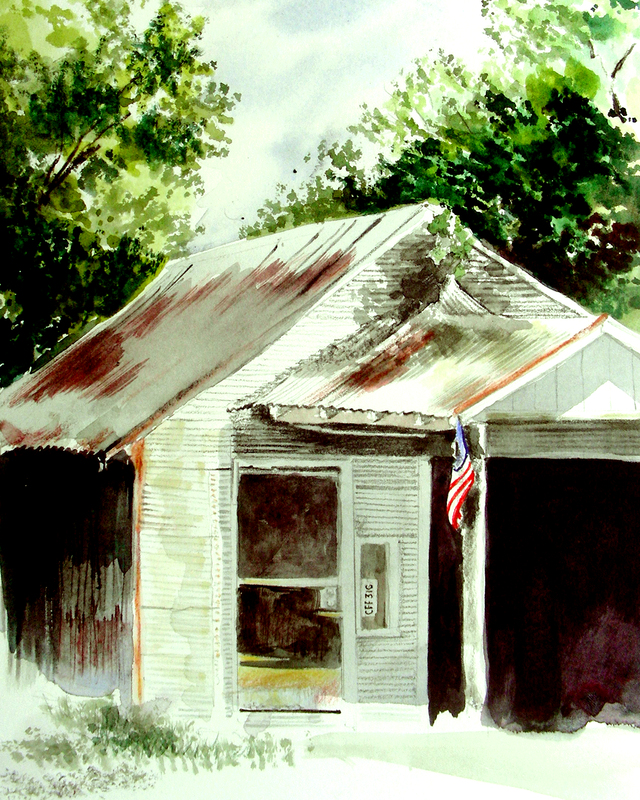 I posted in last night’s blog that the structure reminded me of my grandparents’ home in rural Jackson, Missouri. 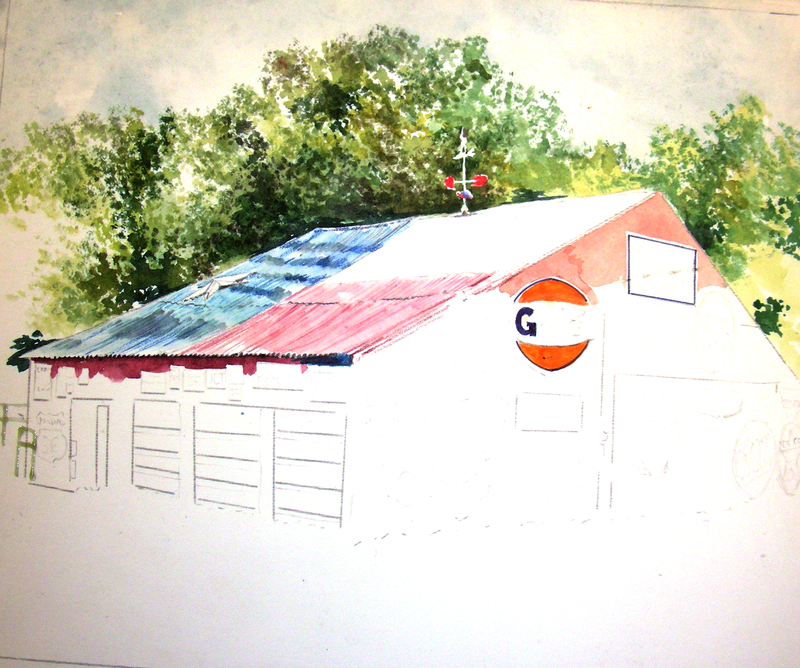 So, this morning I am posting above a watercolor sketch I completed around 1988. It shows something that I had then, but cannot seem to call up now. It was in that day that I used much less watercolor, allowing the pencil and paper surface to do its work. For some reason, I tend to overwork my compositions now. But I have not lost hope; I will try and find a way to return to this earlier technique and rely more on paper and graphite, letting the watercolor pigment support the composition, not overpower it. 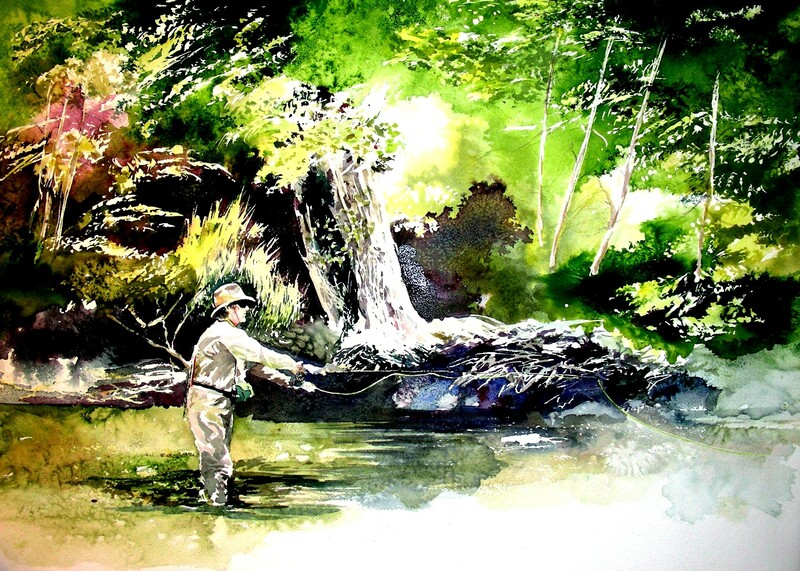 The co-mingled sentiments of contentment and melancholy do tend to reside in me when I am out alone in the field, watercoloring en plein air, and letting my thoughts drift over a thousand memories and anticipations. And there is always something in an abandoned residence standing mute before me that helps call up these sentiments. I wouldn’t have traded yesterday’s experiences for anything, and a part of me is ready to go back to those places remembered (as soon as I finish my job for the day). I blog to remind myself I am never alone. I write to preserve memory. I write what should not be forgotten. Look until you become fascinated. Trust that you will see something. And they will acquire a significance that can be measured in color and feeling. Arriving in Ferris, I felt so serene, knowing I did not have deadlines hanging over me for the rest of the day. Parking in a public lot, I pocketed my keys and strolled all up and down the main street of this town, looking at every building, every landmark, every detail. Nothing really held me. I looked, but did not become fascinated. If you learn to wait . . . Returning to the Jeep, I next drove a circuitous route around downtown, and then saw this closed lumberyard, the front office of the building looking exactly like my grandparents’ house in southeast Missouri that I have painted so many times in past years. I knew I had to give this one a try. If you learn to wait the objects will slowly sink into your consciousness . . . I set up my easel in a vacant lot across the street from the site, and set to work. Eventually the owner of the property came and chatted with me for awhile, and I learned so much more about this business and its history. I was gratified to learn that I am not the only one who recognizes the character oozing from every corner of this structure. The owner told me that it is frequently photographed as a backdrop by people from all around the area. I later learned that the leader of our Paint Historic Waxahachie movement has also picked out this building to paint in past years. When I was about 90% finished with the work, the heavens opened up and dumped rain all over me and this watercolor. 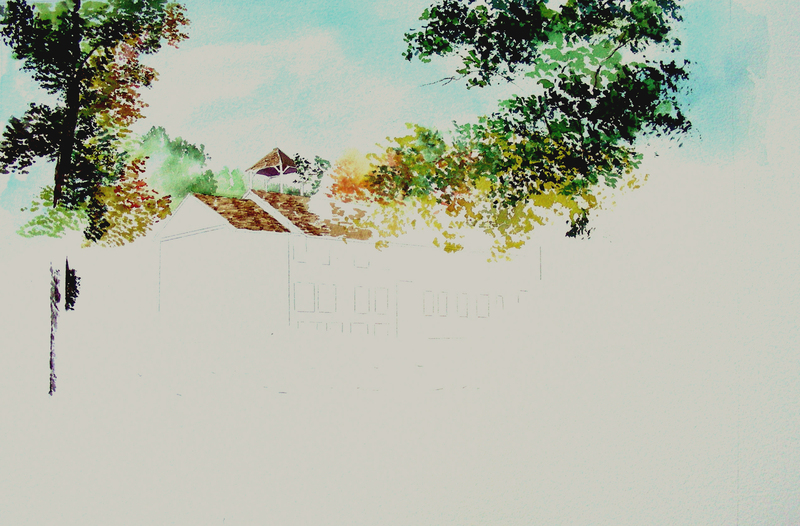 I sprinted to the Jeep, drove to a nearby gazebo and finished the work as best I could from memory of the building. I’m happy with how this one came out and believe I will price it at $200 for the upcoming Waxahachie sale. It is an 8 x 10″ piece that I’m getting ready to tuck into a white 11 x 14″ mat and enclose in a plastic sleeve. It’s been a good Memorial Day. I think an artist should be a sounding board for all these nervous vibrations, and should not just carry a set of rules and tricks around with him, and use them on different objects. The madness continues. Yesterday, having slept too little, I arose around 7:00 and dashed south to Maypearl to paint en plein air, then returned to open the second day of a festival at 4:00 p.m. Getting home after 10:00 last night, sleep managed to elude me until nearly 4:00 a.m. Nevertheless I rose at 7:00 and returned to Ovilla (where I painted last weekend) and made my second attempt at capturing the essence of this abandoned gas station on the main drag of old downtown. The weather remained overcast so I had to invent shadows, but I still liked the cool breezes in the air following last night’s welcome rain. I worked on this piece for two hours and decided to call it quits, return home and prepare to close out the festival tonight. I’m feeling the effects of sleep deprivation, and may have to sleep in tomorrow before going to Ferris, Texas for a second round of plein air activity. The madness of which I speak concerns the simulaneous events of the Downtown Arlington Levitt Pavilion Music Festival (at night) and the Paint Historic Waxahachie plein air event (during the day). Friends call this burning the candle at both ends; I call it too much of a good thing. Right now I’m a painter by day and a festival participant by night, and I hope I’m not coming across as “whiney”. I made this choice. 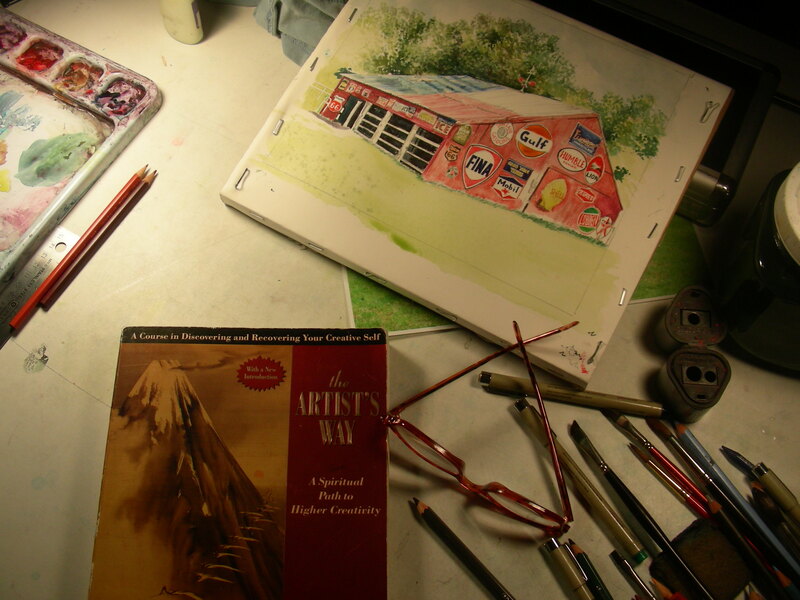 I spent a great deal of time in my art booth last night reading the interview of Andrew Wyeth recorded in the book The Two Worlds of Andrew Wyeth. I had his work heavy on my mind when I came across this filling station this morning and regarded its remnants, thinking of how it had served out its usefulness before the owners moved on to other things. How many of us in life feel that sentiment of being used and discarded? I cannot explain the aesthetic sense of “beauty” I feel when gazing on remnants of abandoned businesses such as this. But the longer I look at them and attempt to paint them, I can only think of what it must have been like to enter this establishment when it was viable, when the proprietors knew their customers in the small town of Ovilla on a first-name basis. 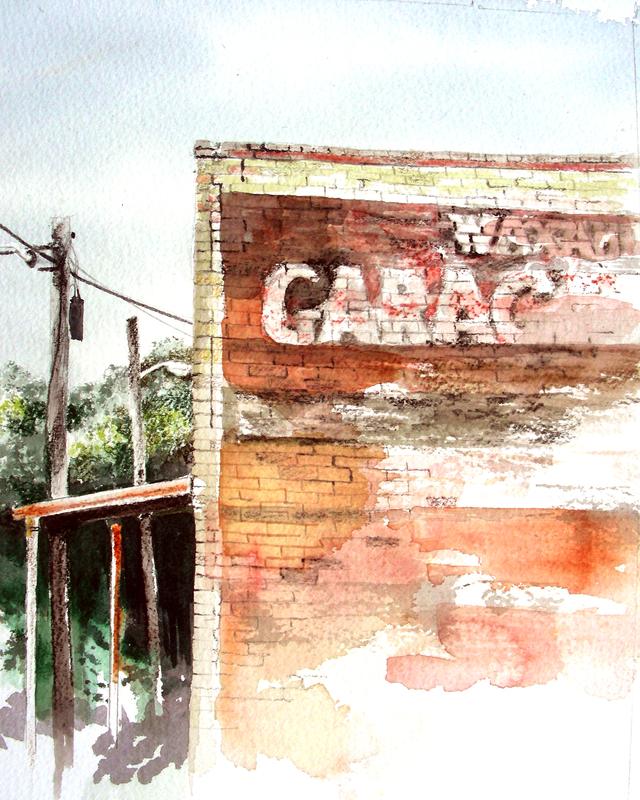 When I painted this subject last week, I enjoyed overhearing the conversations of the men who sat out in front of the open garage bay in their lawn chairs, soaking up the afternoon. Today (Sunday) there was not a soul to be seen or a voice to be heard. But I enjoyed the silence and the musings as I worked over this piece.